Who doesn’t love a beautiful rose? While I’m not sure how they make these – I have seen a bouquet of them in real life. AND lots on the internet (just Google it! Beautiful!) 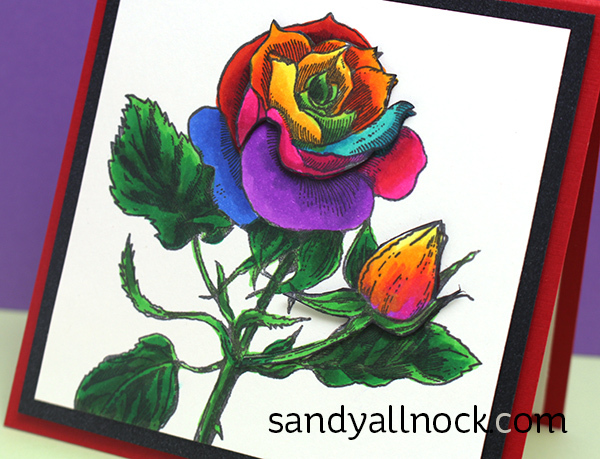 When we’re in control of the markers we choose to color with, well….we can make our roses look like anything we want, right? How about a rainbow! Watch the video below or click HERE to see it in HD on YouTube. Adding Xtreme Tabs to pop an extra layer added nice dimension to the card without being over the top. Where can I find the rainbow graphic with suggestions for copic colours? Thanks. Beautiful! 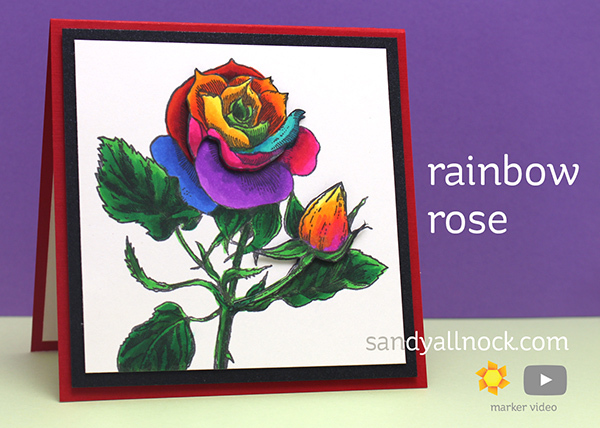 Thank you for the video on how to a color rainbow rose. I will have to venture into the rainbow world soon, you make it look so easy. Wikipedia gives the process for creating. Basically the same way other flowers are artificially colored. Your rose is gorgeous! I think I prefer seeing yours to a real flower that is unnaturally colored. Well, I had to Google ‘Rainbow Rose’ before I could truly believe it – and yeah. Wow. Who knew? (Wait till Laura Bassen hears about this!!!) Anyway, of all the pictures I saw, I like your rose the best – natch. Thanks for not only a lesson in Copic coloring, but horticulture.